Germany is one of my favourite races of the season and yesterday sure didn’t disappoint. After a ‘boycotting’ threat from some drivers regarding the Pirelli situation, I was really glad that Pirelli and the FIA sorted out the issue and we had a great race yesterday at the Nürburgring. As a Vettel fan, I was biting my nails right down to the last lap – the Lotus’ sure did give the Red Bull’s a run for their money. I’m sure the most frantic event from yesterday was the pit lane incident with Mark Webber where the pit crew failed to attach his right rear tyre before the lollipop man let Webber leave the pits. The tyre naturally came flying off as he tried to exit the pit lane, which hurtled towards the Lotus team who managed to dodge it. Cameraman Paul Allen was not so lucky as the tyre smacked him in the back as he was filming Webber down the pit straight. Thankfully reports have said that Allen is recovering in hospital and was treated for a broken shoulder and ribs. 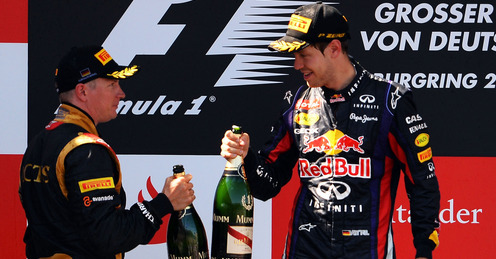 Red Bull have subsequently been given a 30 000 Euro fine for the unsafe release of Webber’s car that caused the incident. Bizarrely Webber didn’t get punished during the race as well, which many people thought odd. Let’s go back to the start of the race. With Hamilton and Vettel on the front row it promised to be a fight to the first corner as both drivers got off the line pretty well. Hamilton ran to the right and it seemed he would push Vettel out of the first corner, but he seriously lost out when Webber came flying down the left to steal second position. A sight that you don’t see very often in F1 races nowadays are engine blowouts, and unfortunately Jules Bianchi was the victim of an engine flame-out around lap 24. I think in his haste to get out of his burning car he left it in neutral and we had the rare sight of an unmanned car drifting across the track after the tractor gave it a nudge. It looked rather funny and we had a good giggle about the situation but in fact it was no laughing matter, as that is a serious safely risk with cars coming down the straight at extremely high speeds and a runaway car is a recipe for disaster. The safely car was deployed and most teams took advantage by taking their pit stops. Hamilton unfortunately lost his strategy advantage as he had pitted just a few laps earlier. In the closing stages of the Grand Prix it seemed as though Raikkonen was going to catch Vettel but the German managed to keep him at bay for the last few laps. 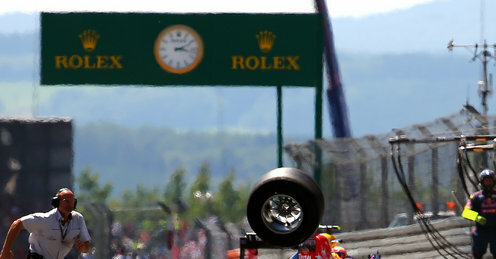 Vettel crossed the checkered flag to take his first home win at the Nürburgring with the two Lotus drivers hot on his heels. Alonso had a good drive and took fourth place, but strangely coasted to a halt on the slowing down lap – possibly short of fuel? Hamilton didn’t do his pole position justice by finishing in 5h place, having moaned about the Mercedes tyre wear. Button was 6th, unhappy about the Caterham drivers’ inability to see blue flags that he says cost him 5th place. No surprise there as Button seems to moan about anything and everything in every Grand Prix race. It’s a long wait for the Hungary Grand Prix on 28 July – enjoy your week everyone! Follow Bianca (The Pit Wall author) on twitter and let her know what you thought of the race.